Exotic, “Egyptian” MYSTIC PROPHET is my third font inspired by Ouija boards, or, strictly speaking, talking boards. (This one is from another company, Haskelite, from the 1940s.) My friend Wink first brought it to my attention. The planchette (the divining tool) is shown here; you can find much more information at the Museum of Talking Boards. My other talking board fonts are Captain Howdy and Sideshow. Includes caps, numbers, punctuation, and international characters. Planchette image courtesy of the Museum of Talking Boards. KING XMAS is a versal, or Lombardic, alphabet inspired by a small sample in a 1930s Speedball book. The current version combines two fonts in one: solid in the uppercase positions, white-starred letters (like the words above) at the lowercase position. It pairs nicely with a bold blackletter font like Fette Fraktur. Now with Arabic numbers in v2.5. HARLEQUIN was inspired by this poster from the 1953 film Kiss Me Kate (detail at left). It has a jolly jester’s hat feel and also resembles turned wooden spindles. Includes caps, numbers, punctuation, and international characters. As seen in use in these “personalized totes for the eco-check girl,” from Label Me Lisa. The Dominican fonts are designed to look like old letterpress printing. Originally inspired by a font from Dan X. Solo’s books, I expanded the series to also include Italic and Small Caps. Version 3.0 now contains lining figures with the old-style figures still available as stylistic alternatives. All 3 fonts have been expanded and refined, making these a fine alternative to the overused Caslon Antique. BACKHAND BRUSH is my re-creation of a classic 19th-century style of hand lettering. Like some Victoriana and Art Nouveau fonts, it was revived in the psychedelic era. My font is completely redrawn from a guide to hand-lettering, not a font. I have regularized it somewhat (maintaining a constant 18-degree slant) but also tried to keep a slightly random brush feel. Includes upper and lowercase, numbers, punctuation, and international characters. STELLA DALLAS was inspired by the hand-lettered titles of the film of the same name (1937, directed by King Vidor, art directed by Richard Day). The dramatic wedge shapes and some letterforms are reminiscent of calligraphic fonts like Koch Antigua. Working from the film, I’ve regularized and rounded out the font, including small caps weighted to harmonize with the large caps. The set includes 3 fonts: Regular, Outline and Fill. 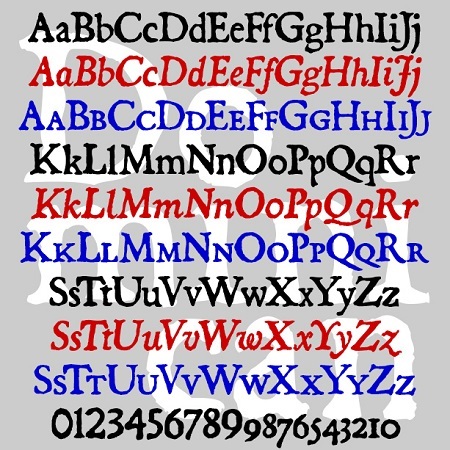 Each font includes large and small caps, numbers, punctuation, and international characters. .